We just finished filming a segment with my three gorgeous emus Cosmo, Ernie, and Napoleon. It was the first time that my emus have EVER seen a camera crew and what can I say? It was an incredible experience! A lot of people know that I love my three birds to death…but what a lot of people DON’T know is that I have had a long history with my emus that started many years ago at an early age. Ever since I can remember I have always been fascinated with emus. They always reminded me of “modern day dinosaurs.” The way they walk, the way they move, and the shape of their feet all resemble ancient creatures that once roamed this earth. Here at fifteen years old, I am pictured with Cosmo. He was just a little chick when we received him in June of 2005. Emus are born with stripes. This serves as disruptive camouflage similar to zebras. It confuses any potential predators that would want to make them a snack. Pictured above are Cosmo, Ernie, and Napoleon as chicks. I remember that for several months they were very skittish. It took AT least a year before they gained my trust and became friendly. Here is Napoleon pictured as a juvenile. Emus lose their stripes after several months and start developing their shaggy feathers. They are naturally found in Australia and can withstand the continents hot dry weather and cool nights. That makes them perfectly adaptable to Idaho’s extreme temperatures. 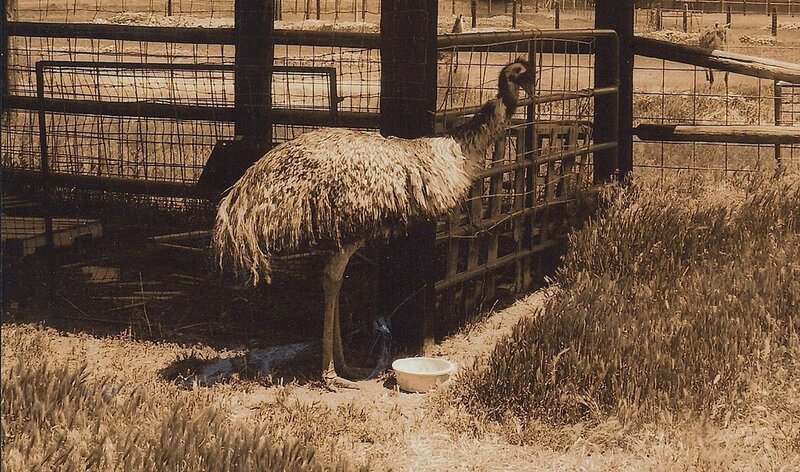 The first pair of emus brought into Idaho cost a farmer $65,000. People were convinced that the emu would take over the cattle industry. They were used for their meat, eggs, feathers, and oil. The demand was not met and these days you do not see too many around in captivity. Popular or not I still love my birds the same and can expect them to live into their twenties in complete harmony.